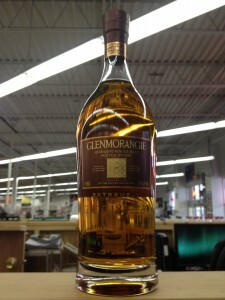 Part 2 of my Glenmorangie Scotch Whiskey Reviews from a tasting on February 13th. This post took a bit longer to get out because I honestly was quite conflicted for some time over which of two of the Scotches below was going to be the first recipient of a new rating designation “The Golden Cat”. This is a designation that exceeds 10 Black Cats. But the effort (as trying as it was at times) was worth it so that I could bring to you, my readers, an honest determination of the first recipient of a new rating designation from your reviewer. I am glad that I took the extra time to do the “research” and wait to publish this second post from my Glenmorangie tasting. 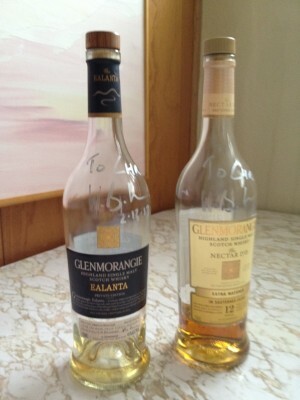 I think you will find 2 single malt Scotch Whiskies that are quite superlative (and another that is quite, quite good). Since I detailed much about the distillery and the man behind the creations Dr. Lumsden in Part 1 of my Glenmorangie Scotch Tasting Review, I will go straight into the reviews of the final 3 Whiskies that we tasted that night. Onward…. 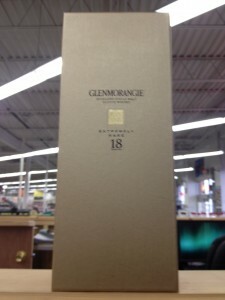 The 18 Years Old is a single malt Scotch whisky of serious distinction. Once it has spent fifteen years maturing in American white oak casks approximately 30% is transferred into Spanish Oloroso casks to spend a further three years maturing. Then, when both elements have reached 18 years, they blend them back together to create a whisky with a rich bouquet and full, rounded flavour. 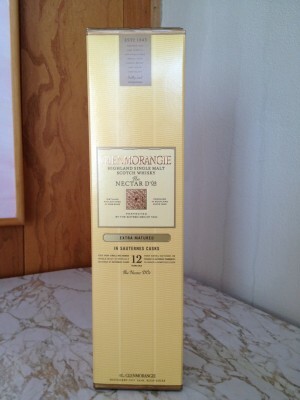 This is a very pretty whisky in a very attractive bottle and box presentation. At 18 years, it is the oldest of the Glenmorangie’s that I have reviewed so far… so it should be phenomenal but it is just very, very good. It is interesting and somewhat unique that only approximately a third of the casks are transferred to the Oloroso casks and then they are mixed back together at the 18 year mark. Dr. Bill said that this was by design as he believes that if 100% of the casks were in the Oloroso for those 3 years it would impart too much of the sherry characteristic of those barrels. Making great whisky truly is a science after all! I liked this whisky a lot and would be quite happy if someone gave it to me, but don’t think I will be spending the $90 – $120 (it really varies for some reason) to purchase it. Although it has to be written that this whisky has won many awards including the Double Gold at the San Francisco World Spirits Competition in 2010. Taste: The mouthfeel has a lovely viscosity… a nice creaminess. Honeycomb, lemon, sweet and tangy citrus, caramelized fruit, leather, horses saddle and loads of mentholic diethylacetyl produced by the long maturation. Balance: Very nicely balanced. A well orchestrated song that you feel doesn’t lose you at any certain point. Overall: Like I wrote earlier.. I like this whisky. 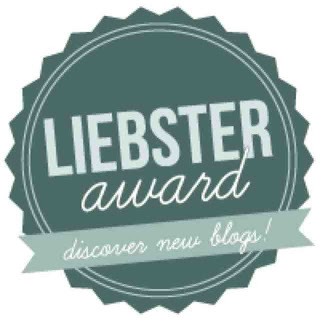 I like it a lot… but this post reviews three exceptional whiskies and I consider this one to be the least of the 3… but being the least of 3 great objects is nothing to feel ashamed of. 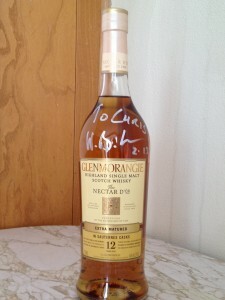 This glory of a whisky is part of the “Extra Matured” line from Glenmorangie (of which the Lasant and Quinta Ruban are also members which I reviewed in Part 1) which denotes that the first 10 years are in bourbon casks (first used once by bourbon distillers in the US and then shipped to Glenmorangie) and make it essentially their “The Original” 10 year, and then extra matured for 2 years. In the case of Nectar D’Or, that extra maturation occurs in hand selected French wine barriques from Sauternes: the most famous and ancient sweet wine growing region of France, that from this whisky develops its rich, spicy and dessert-like flavours. There is only one other distillery that I know of that has a whisky that they mature in Sauternes casks and that is the Arran Malt. The Sauternes casks are from the Bordeaux region of France and are known for their desert white wines. This French oak has a higher level of tannins than most wood. 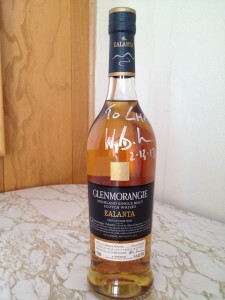 This whisky is just one more example of the genius of Dr. Bill Lumsden and the adventureness that the distillery allows. It may be hard for you to think of a whisky costing around $75 to be a steal, but I believe this one to be. It is magnificent. Nose: Utterly and genuinely beautiful! Like a fine French perfume. Lemon meringue pie, vanilla and pineapple cake dusted with coconut. It reminds me of walking into a French patisserie when I lived across the border in Belgium. It reminds me of a momentary lull in the chaos and that beautiful feeling of staring out the window of a small cafe on a day off with sumptious smells wafting through the room and nothing to bother you but the fact that you will at one point have to leave. The nose of this whisky is phenomenal. Taste: The mouthfeel is the best I have reviewed yet! Just sumptuous and rich like an extravagant desert. There is simply an incredible structure of taste (yes a full fledged structure) that is imparted from the French casks. Kiwi, Pineapple, Clove.. a bit of star anise. It is a very unusual taste. This whisky has a very unique and unusual taste… and it is utterly brilliant! Balance: Balanced brilliantly. Not too balanced to be forgettable, but perfectly balanced like a fine symphony. Overall:This whisky is a gorgeous and extravagant desert in a glass! While still being utterly whisky and utterly Glenmorangie. This is heavenly drink! 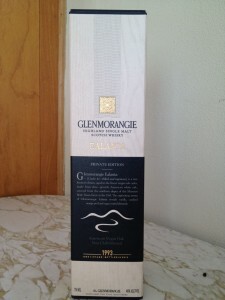 Glenmorangie Ealanta is the fourth annual release in their award winning “Private Edition” range. I was lucky to try this whisky before it was available in the U.S. because Dr. Bill brought it with him to the tasting as a special treat. In the early 1990’s, Dr. Bill traveled over 5000 miles to the Ozark Mountains in Missouri. His quest was to hand select the finest oak wood for casks that would produce a very special whisky. On the northern slopes of Missouri’s Mark Twain National Forest, named after “The Father of American Literature”, he discovered a number of superb slow-growth American white oak trees. The porous oak wood, air-dried for over 2 years, but in this instance never seasoned with any other whisky, allows their precious spirit to extract maximum flavours as nature intended – producing a whisky of incredible taste and smoothness. These virgin oak casks were heavily toasted but no bourbon had ever been in them. 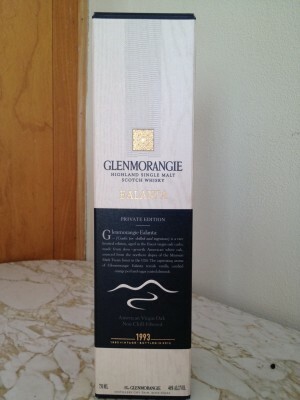 This wonderful whisky retails for between $110 – $120 and I am certain I will be buying it again. Nose: A glorious forest! Loads of vanilla, butterscotch, maple syrup, a ball of butter rolled in sugar, and candied orange peel. Taste:A mouthfeel of velvety effervescence and buttery cream. Sumptuous. The notes of flavor are all in HD.. alive and fully formed in their own right yet none overpowering any others. Vanilla, stewed apples and plums, candied orange peel. Eucalyptus on the top note with menthol. Creme brulee, toffee and sugar coated almonds. Balance: The word balance doesn’t even really apply here. It is beyond balanced. It has chapters that can be read alone and enjoyed, and can also be read as one complex tome over and over and perhaps never fully appreciated because of the complexity. Overall:The thing about this whisky that almost astonished me is that it was truly different at different tastings.. on different days. Always great, but at times was just different. It is that unusual. I am certain that the fact that it was fully matured (as opposed to extra matured) in very unique casks is the main reason that this whisky rises to a new level. Honestly writing about it doesn’t do it justice! It is simply and humbly brilliant. How do you score two objects of greatness? This is something I pondered on for some time. 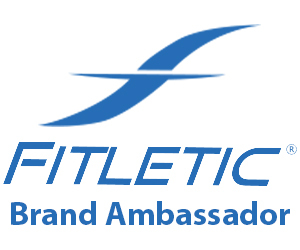 I knew that one of them deserved a special designation and I did come to determine which one and am very comfortable with that decision. But what do I do…. 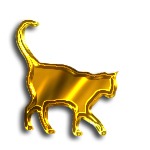 do I give the slight lesser a 9.5 Black Cats and the other the new Golden Cat. No in this case I cannot do that. There is a 10 Black Cats and a Golden Cat. Greatness and Greatness! 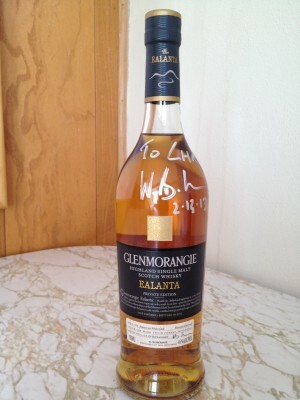 A big thank you to Dr. Bill Lumsden for his genius and for Glenmorangie for allowing it to be expressed! 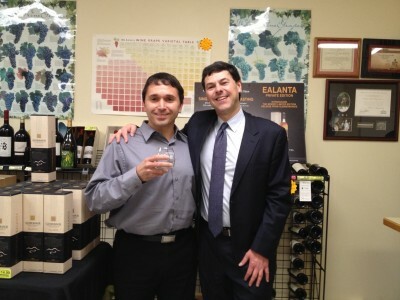 This entry was posted in Liquor Reviews on April 28, 2013 by Chris M.